Intuitive Creatures are a four piece deity of comedic genius. 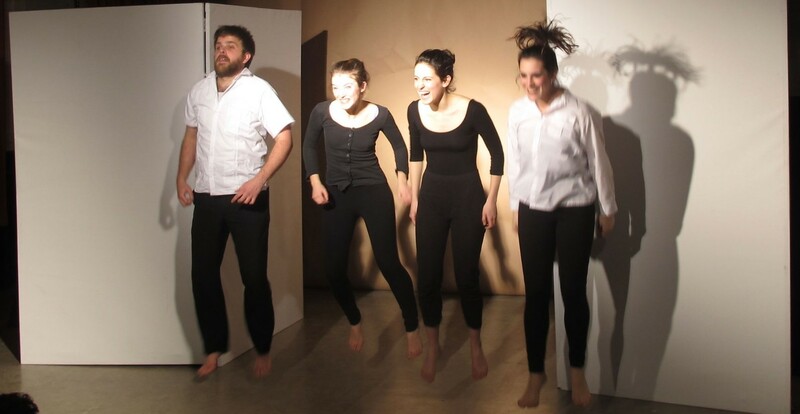 Having come together from a previous collective stint at the London International School of Performing Arts (LISPA), and in fusion from a love of Jacques Lecoq, the multi-national quartet have embraced popular notions of physical theatre, as well as elements of metaphorical performance, to present Intuit This to the Camden Fringe. Somewhere between a parody and a partake of cultural reference to reality television and prime time dramas, the production is a truly visceral sensation with an anthropomorphic approach to existence. Much like the aims of contemporary docudramas, Intuit This exploits representations of human failures and characteristic quirks but under a guise of metaphorical comparisons to nature. Under the spectral umbrella of physical theatre, the hour long production employs live music, song and dance in a simplistically visual setting and post-modern, post-dramatic performance. As the title might suggest, what the audience is required to do is perceive, rather than think. In a clever use of pantomime spectacular, Intuit This challenges perceptions of social structures, as well establish the traditional performer/ audience relationship. Mostly rejecting concepts of true mime, they are nothing if not loud and literally in your face. Comfortably confined to on-the-road proportions at Camden’s ‘new and experimental’ theatre, and embracing influential expressions from Decroux, Laban and Lecoq, the group utilise dance and song from the aspect of actors, rather than dancers, and encourage a mutual conduct of expression between seat and stage. Each actor takes on a number of roles, adding to the hilarity of it all. Circulating from behind two barely sizeable, makeshift stage props, they embrace a range of characters, both human and inanimate. Leading (well, only) male actor, Dan Onslow, conceives categorical imitations towards a slide of male paragons. Eliciting snorts of laughter from the off, Onslow finales with a hysterically warped monologue with special consideration for the male members of the audience. Paula Valluerca is masterful in her use of corporeal mime and allusion to her background in dance, while Rosin O’Mahony displays unnerving intensity, as well as a brilliant comic stance in her portrayals of original characters. Chiara Goldsmith is a beguiling delight; her eclectic ability to depict identity, attitude and emotion is hilariously enchanting, while her capacity to entertain appears endless. Goldsmith and O’Mahony work in perfect harmony as a pair, while Valluerca and Onslow derive a brilliant concept of gender miscommunication. Intuit This is a top piece of physical theatre and a duly worthwhile reason to head to the CPT this week, promising one hour of tear-inducing laughter that will leave you wanting more. Just don’t sit in the front row if you’re a shrinking violet type. Since 2012, Intuitive Creatures have been hosting free theatre nights across South London, as well as monthly performances in a North London art space. You can catch the bunch from 12-18 August at Camden People’s Theatre, or every month in Random Blossom Cabaret at The Others in Stoke Newtington.